Electroneum, denoted by ETN, is built on Monero’s core to allow transactions on a decentralized blockchain. The key privacy feature of Electroneum is its stealth address, a one-time public key which does not link the recipient’s funds with their wallet. If the user opts for public view, any third party can audit the address to prove the transaction was complete. In return, the recipient receives their funds through their wallet’s private view key which scans the blockchain. The entire transaction is complete without any public linking. Transactions are fast based on the network traffic and are charged less than 0.2 ETN in total fees. There is a new block that is added every minute. Electroneum is getting traded at 0.006192 USD on April 09 at 12:54 UTC. Based on the Mcap value of USD 57,244,291, ETN is positioned in the 95th rank in the cryptocurrency market. The market value is influenced by the circulating supply of 9,245,442,245 ETN coins and the 24h volume of USD 438,068. The approximate return on investment is evaluated by Coinmarketcap and is estimated to be -93.48%. This indicates the deterioration in the current market of the cryptocurrency. 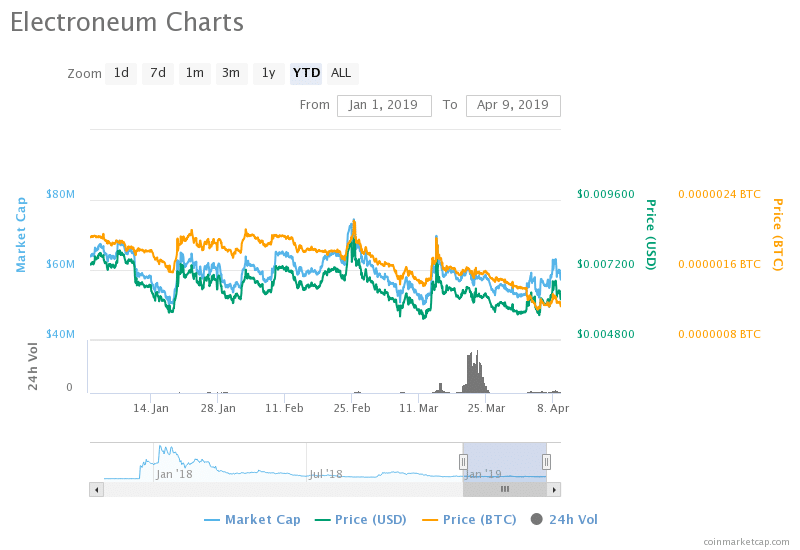 Electroneum is a highly volatile cryptocurrency, due to which the market observes consequential variations in the Mcap value and the trading price of the cryptocurrency. The market capitalization of the cryptocurrency spiked from USD 58 million on March 13 at 13:54 UTC to USD 70 million on March 14 at 13:54 UTC. The hike was calculated to be 20.83% within a span of 24 hours. However, there has not been a noteworthy difference in values after that. The price values were on the increase from April 02. A noticeable climb in values was observed between April 07 at 02:54 UTC and April 08 at 05:54 UTC. The values grew by 15.57% concerning Mcap values and 15.49% in trading price. The current market is running short by 11.39% from its peak pricing. Accurate price prediction for highly volatile cryptocurrencies is rather a difficult task. However, Cryptoground estimates an increase of 117.56% by 2020 with the price reaching around 0.0134 USD and a further increase of 2,838.06% to 0.1814 USD by 2024. This prediction is bullish pessimistic considering the current market trend of electroneum. In contrast, analysts from wallet investor estimate deflating price values to around 0.000484 USD by the beginning of 2020. The unpredictable rise and dips in values push the market in favor of the sellers. However, the fluctuations can work out advantageous for traders with short term investment plans. Their contributions will subdue the volatility of the cryptocurrency, thus increasing the value gradually.